Aangan continues to be repetitive, unimpressive and unconvincing. Even after all these weeks, there isn’t a single character which I can connect to and root for. Right from the first episode complete focus has been on visuals with the script and the screenplay taking a backseat. The over-literary dialogues do not go well with the shallow characters and the over-emphasis on the makeovers and the cinematography clearly suggests that the producers did not give the viewers enough credit! It is tedious sitting through an entire episode of Aangan even when you skip the commercial breaks. The viewers see their favorite celebrities looking pretty on social media, in commercials and functions all year long therefore the drama makers should realize that good makeovers do not make up for a bad script and can in fact add further to poor execution. This episode covered Jamil’s confession, Chammi’s madness, Alia’s confusing state of mind and Daddi’s demise. I am still trying to figure out what the purpose of this drama is since it has been presented in such a ‘grand’ manner and it was promoted like it was the next big thing. 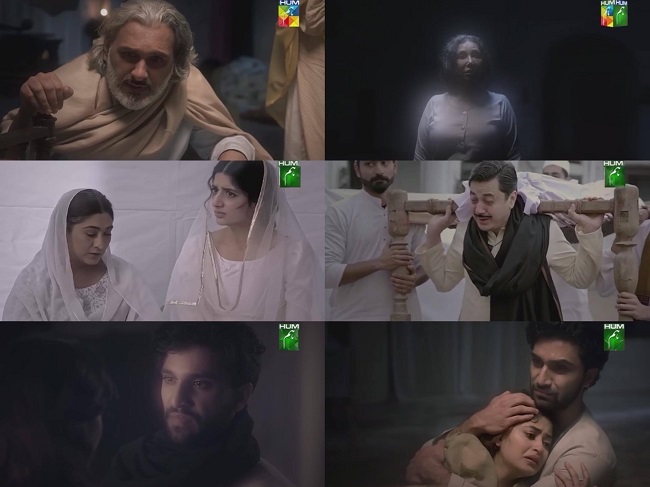 Aangan is definitely not engaging and the seriousness with which it has been presented on screen does suggest that the team Aangan had a bigger purpose in mind yet even after all these weeks it continues to be pointless. The viewers also found out tonight that Najma was still alive although her mother never thought of her even once! Israr’s character is a disgrace since he has hardly been given any screen time yet somehow the viewers are supposed to feel for him. This episode was also filled with meaningless conversations which did not add anything new to the story. Jamil and his mother’s fascination with finding a parhi likhi bahu and Jamil’s ‘love’ for Alia made me wonder if this time a man will actually do something extreme and ‘rewrite’ this Aangan’s history! Chammi and Alia too had the same conversations in this episode. While Alia worried about Chammi growing distant, Chammi felt insecure because she could see that Jamil was falling in love with Alia. Chammi has always been blunt and honest but tonight she lied to Alia when she said she was looking out for her. The physical closeness in the scenes and the dialogues tonight yet again suggested that Jamil was incapable of falling in love with anyone at all. The scene on the balcony with Alia was quite similar to the one we saw earlier when Jamil was flirting with Chammi. Some of the dialogues in this episode were completely out of context which lead to even more confusion. I am finding it really difficult to digest the fact that Safdar disappeared after writing those letters. The person who informed him about Tehmina’s marriage must also have told him about her death and Mazhar’s arrest. The overly-staged treatment given to this play coupled with a script which is clearly going around in circles and is pointless makes Aangan one of the biggest disappointments of this season. After watching this episode of Aangan there are a few questions in my mind and no they are not about the characters or the plot. I am wondering – what were the makers thinking? How could such wonderfully talented and creative people go so wrong? How will this Aangan survive for another 8 weeks or so? Who will tune into the next season considering how badly written and executed this one is? The preview of the next episode showed that Najma will make an appearance in the next episode and Chammi will probably bribe Shakeel to make Jamil jealous!